Industrial Roofing Services are composed of Plygene Gutters Approved Installers. Gutterline has the ability to stop gutter leaking. This offers a cost effective, efficient and easy method which lasts for good. The Gutterline system has the ability to create a fully waterproof and totally sealed gutter inside a gutter. This leaves the unique gutter unscathed. It simply means it doesn't need for any mechanical work. Many industrial establishments choose to use Gutterline because it can be used on any type of gutter. It is easy to fit, supplied on a joint free and seamless roll and made to measure to fit your gutters. 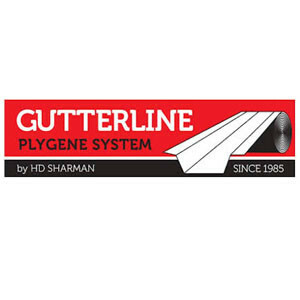 The Plygene Gutterline system was manufactured by the professional HD Sharman. It is a material that is extremely durable and has a 25-year warranty. The Plygene Gutterline is flexible enough to mould to any type of gutter profile. At the same time, it will endure changes in building movement and temperatures. This prevents cracking or splitting. At Industrial Roofing Services we use Plygene Gutterline as our product of choice when dealing with gutter repairs. We also use this for gutter refurbishment, gutter maintenance and gutter installations. Our company is recognised as Plygene gutters installers and Gutter specialists. All Plygene Gutterline is manufactured in the HD Sharman factory. The product is a fully patented and exclusively formulated rubberised Plygene. This can then be used to produce a waterproof seamless lining. Plygene Gutterline provides a unique performance and technical superiority. This means that when it is fitted, it will contend with the most extreme climatic changes. It will also be able to tolerate severe structural movement without cracking or splitting. With its ever-increasing popularity, Plygene Gutterline has been used to stop gutters leaking. This can be used on just about every type of gutter from old Victorian mills to modern shopping malls. It can also be used on guttering in warehouses, mansion houses, small office buildings and massive structures. Our professional Plygene Gutters installers have undergone intensive training for using this product. This assures our clients that they can execute their job well. Gutters in excess of 200 meters long have been successfully lined with a single length of seamless joint free Plygene Gutterline. Gutters which are over 4 meters in width have posed no problem for the versatility of the Plygene Gutterline system. We also guarantee our valued clients that they will never be disappointed with the quality of work. If you are looking for the best Plygene Gutters Approved Installers call Industrial Roofing Services. We are the ideal company to consider and hire. Contact us today and we would be happy to help you out.